The Top 100 Rated Weapons is a list of weapons that have received the highest ratings from our iDB Raters. If you want to read their full ratings for the weapon, go to the weapons In-depth page to see the full rating text. In order to be eligible for the list, a weapon must have a minimum of two ratings. This means that once a weapon has been rated high enough by two iDB raters, it will automatically appear on the list. 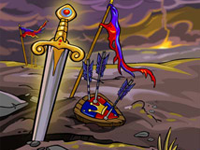 The list will change over time as more weapons get ratings and new weapons are released, so keep checking back for changes and to get a look at the top tier weapons in Neopia!